This article sketches out a rail referendum proposal for Austin in 2020, explaining why elevated rail is a better transit option. (I’l go into the politics of elevated vs. surface in a subsequent post.) My 2020 proposal would consist of five principal items: 1) a closed system of elevated, autonomous rail from Republic Square to the North Lamar Transit Center; 2) pedestrian and bike platform(s) using the same supports— that is, a planned High Line; 3) City of Austin ownership of everything not directly connected to running trains or collecting fares; 4) a phase two that would continue those elements across Lake Lady Bird to Riverside Drive at least as far as Congress; and 5) money and authorization for CapMetro to buy land along future high capacity corridors with an eye toward capturing increased land value. The capital costs of elevated are typically 2 or 2.5 times as much as surface LRT, but I’d assume 3 times as much to include the elevated pedestrian and bike infrastructure. Closed System of Elevated, Autonomous Rail. This is basically the Higher Investment option outlined in CapMetro’s flip books and boards on the North Lamar corridor, except that it would be a closed system as far as the North Lamar Transit Center. Rather than continuing surface LRT to Tech Ridge, for now we’d feed buses into NLTC. (Note that the “Comparing Options” graphic compares Bus Rapid Transit to a rail line that would be elevated south of Crestview. There’s no entirely surface light rail investment in that graphic— hint, hint.) Surface LRT combines BRT’s travel times and elevated’s annual Operations & Maintenance, which you can see here. CapMetro’s estimates show elevated with lower Operations & Maintenance costs on a per passenger basis because elevated would be more popular with riders than surface LRT. The capital investment, which the feds usually contribute to, is higher but performance afterwards, when CapMetro will be paying for everything, is much stronger. Elevated rail is also much, much safer than surface rail. The research comparing urban rail modes for fatalities is skimpy, but it points in one direction. (European research on trams is surveyed here.) Street-running LRT is more dangerous on a passenger miles basis than bus or grade-separated and may be more dangerous than urban auto trips. Grade-separated rail with platform screen doors to prevent accidents and suicides is the Vision Zero for transit. Platform screens would also make it possible to air condition roofed waiting areas. Every LRT accident involving pedestrians, bikes or cars also delays the system, usually by about an hour, as bodies and debris are cleared from the tracks. If a bus gets in an accident, other buses can go around; no so with light rail. Besides safety, the big advantage for elevated is speed. Austin’s elevated probably wouldn’t need to reach the same top speed expected for Honolulu’s planned elevated line (55 mph), but we’re probably looking at around 16 minutes travel time from the North Lamar Transit Center to Republic Square, including stops, instead of 23 minutes for surface rail. Because autonomous trains have lower marginal costs per train— no driver to pay— it’s easier to afford shorter headways and longer hours. Vancouver, for instance, gets headways down to about 2 minutes. Closed system autonomous rail has decades of proven success while automation of surface rail is probably a couple decades off. This combination of shorter headways and faster speeds will tend to save riders about 10 minutes over the 6+ mile span I’m proposing. Elevated’s expected higher ridership figures are attributable to the time saved. Pedestrian and Bike Platform(s). As far as I know, no city has attached ped/bike platforms to an elevated rail line— except maybe some bridges. With our own High Line, we’d be able to walk or bike, often in shade, from NLTC to Republic Square without the obstacles of traffic lights or danger from cars. This would be a UVP (Unique Value Proposition) for Austin. Seems easy technically. Probably adds about $300 million to the price tag. And this makes it easier to argue for City of Austin ownership of much of the infrastructure. City of Austin Infrastructure Ownership. The aesthetics of the elevated stations are going to be a challenge. Supports and platforms are ugly from underneath. On the other hand, transit agencies haven’t really tried very hard to make them beautiful. If CapMetro owns the stations, they’re going to be run with efficiently-operated transit in mind. (Although I do have to give CapMetro credit for the Art Boxes at select MetroRapid stops.) But if the City owns the stations, they’ll be designed and maintained and eventually upgraded with a broader set of goals. The unit of government that pulled off the New Central Library just might be up to this design challenge. The neighborhoods around these stations will have much more political pull with the City than with the transit agency. Phase Two. The Guadalamar corridor is far and away the best choice for such a large transit investment. With Downtown, the Capitol, and the University of Texas, this corridor will have the strongest transit ridership as far as the eye can see. Elevated rail from Republic Square to the North Lamar Transit Center would function as most of the spine for high capacity transit, but going across the river is essential. Phase Two should include elevated rail from Republic Square to Auditorium Shores and then east at least to Congress Avenue. With that elevated spine in place from NLTC to Congress at Riverside, CapMetro would have plenty of options for its next rail segment. Breaking a rail plan into phases has important advantages. Obviously, it gives CapMetro some flexibility for the later phases, with respect to both mode and geography. But we also don’t want to get caught in a Honolulu-type bind. At the trough of the last recession, they priced a 21-mile elevated line at $5 billion and secured federal support for $1.55 billion. The project was hit with delays and the post-recession market price for building materials increased substantially. The project may end up costing $10 billion, but federal funding is frozen at $1.55 billion. And here’s the kicker— that federal funding is dependent on project completion as promised, so they can’t trim costs by cutting stations. If we do Republic Square to NLTC as an initial segment, we’ll have a better idea what extensions will cost. the future. These acquisitions will make it easier to erect stations or other transit infrastructure like bus stops, rail & bus yards, and transit centers. But mostly, the land would be leased to profit-making enterprises with an eye toward filling CapMetro’s coffers and achieving social purposes like building affordable housing. Once rail or BRT is in place, those parcels would increase in value and CapMetro would capture some of that increase with higher land rents. Until that happens, it’s not actually necessary for CapMetro to demolish whatever’s currently on the parcel; CapMetro could buy the land and lease back to the current owner for a suitable price and time period.These leases would help provide operations resources. 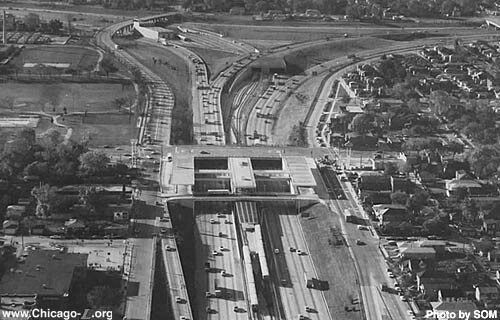 Most of the really compelling corridors would connect to that elevated rail spine from NLTC to Congress at Riverside. These would include South Congress, Riverside to the Airport, South Lamar, Manor Road (via Dean Keaton), and NLTC to Tech Ridge. CapMetro needs to get across that those corridors won’t be ignored, but mode will depend on a corridor’s projected ridership and the preferences of neighbors. This spine of elevated rail from the North Lamar Transit Center to Republic Square and then across Lady Bird Lake along Riverside could complement a number of future modes: more elevated LRT, surface light rail, bus rapid transit, conventional fixed route buses, virtual trains, or even just function as a transfer point for autonomously-driven vans. In another article, I’ll get into the politics of surface vs. elevated rail, but, in short, a bike/pedestrian platform would add additional constituencies for the project and many people overestimate both Hyde Park’s opposition to elevated, as well as that neighborhood’s heft in a referendum. The most common pushback from my first article on LRT safety was, basically, that Europe wouldn’t run trams if street-running rail weren’t safe. I’m not sure why people think Europe is safety-conscous, but I thought I’d do a survey of academic literature on trams/LRT safety research there. …showed that public spaces laid out for modern trams in French city may contribute to some forms of traffic injury accident mainly due to the relative complexity of these public spaces and to severance effects on sections with lanes strictly dedicated to trams. However, she also looked at two tramways that had started in Marseilles after 2000. Comparing before and after data, Maitre found something at odds with her earlier research. (I)n the streets affected by the tram, the effect attributable to the implementation of the tramway system is an accident reduction of approximately 64%. This effect may partly result from the layout of the re-designed public space in these streets, but this could also result from the decrease of traffic volume, since modern tramways in French cities tend to strongly reduce the space allocated to cars in the streets where they are implemented. Overall, the beneficial effect of tram (in terms of safety) suggested by these results remains questionable, however, since the possibility that car traffic and accidents may partly migrate towards other parts of the road network cannot be excluded. I haven’t found any similar & completed studies that critique Maitre’s recent findings. The idea that trams and street-running LRT reduce accidents or fatalities in the general area warrants further examination and that’s supposed to be part of the Dumbaugh-Brakewood research project. But other notable European tram/LRT research points to safety problems. Working with Norwegian data, Friduly Sagber and Inger-Anne F. Saetermo concluded that trams had, if anything, worse safety numbers than I posted in the first article. Using per passenger-km, “the total risk of accidents for the tram is 3 times higher than for the bus.” But more importantly for my argument that street-running LRT is warping American LRT safety data, they found that segregated track has about a tenth of the collisions of other types. Annika Hedelin approached tram safety research from a public health background. Publishing with two co-authors, she found similar numbers for comparing bus and tram safety, although these are vehicle-mile rather than passenger-mile. The risk of suffering a non-fatal injury was four times higher per vehicle-kilometer for tram traffic compared with bus traffic, while the risk of death was 9–15 times higher for tram traffic. The injury incidence in relation to age had a biphasic shape with the highest risks for young and old people. However, the tram injury rate for men was highest for middle aged men (30–49 years at age). Three quarters of those injured both in bus and tram incidents sustained their injuries at bus or tram stops, or at pedestrian crossings. One third of the injury cases with trams, and one quarter with buses, occurred in the dark. And in my prior post on LRT safety, I linked to a Vancouver blogger who found subways to be an order of magnitude safer than LRT in France. As in the United States, the decision is made to lay down street-running LRT without seriously considering the safety advantages of alternatives. During design, some effort is made to lay out a safe rail line at the chosen grade, but more effort is spent afterwards mopping up. Across Europe, transit agencies have spent a lot of money to improve LRT’s interactions with other street users at safety “hotspots”. Eventually, agencies turn to safety promotional campaigns. Consider Dublin’s LUAS, which is apparently a well-run LRT system. Derailments and crashes with heavy duty trucks are usually the only time LRT passengers are endangered— consider this 2012 collision with a refuse truck. The larger threat is for guilty and oblivious street users. Consider the auto crash video clips LUAS released in their campaign to stop drivers from running red lights. Then there’s this near-misses video showing how cyclists almost died because they weren’t paying attention. And here’s the same scare tactics message— that LUAS is life-threatening— going out to pedestrians. Of course, it’s never LUAS’s fault. Everyone just needs to act like LUAS expects them to act. To help drivers act like LUAS expects, Ireland’s first red light camera was installed with LUAS in mind. Light rail in America is about as dangerous as the automobile trips they replace and twice as dangerous as the bus trips they replace, according to the data I’ve found on the subject. While I intuitively figured that my favorite mode— elevated rail— was safer, I began this research blissfully believing that transit was always safer than cars. Not true, apparently. The good news is that some LRT systems are much, much safer than others, with design the most important factor. The aggregate fatality rate for auto travel is around 15 persons per billion vehicle-miles of travel. However, this includes rural travel, where the fatality rate per billion vehicle-miles is 23. The nationwide fatality rate per billion vehicle-miles of urban automobile travel is 11, and when passengers are included, it drops to 10. Thus we find that light rail’s 14 fatalities per billion passenger-miles of travel and commuter rail’s 12 fatalities per billion passenger-miles of travel are actually higher than the rate for privately operated automobiles. Also note that Semmens— and everyone else— agrees that buses and grade-separated rail are safer than driving, almost twice as safe. I believe he’s right to use “urban auto” trips since that’s what LRT replaces. And I’ll add that a disproportionate number of auto fatalities occur in the wee hours when most light rail systems sleep. Todd Litman of the Victoria Transit Policy Institute finds similar numbers for Heavy Rail, Transit Buses, Commuter Rail, and Passenger Cars in this pro-transit article entitled “Safer Than You Think”. (See chart on page 11.) And note that he has no corresponding bar for Light Rail. In the first p. 10 chart, he lumps light in with subways for “passenger fatalities”. Maybe Litman has some reason for doing this, but it would have been a good opportunity to refute Semmens if he could. Jeff Sabatini with Car and Driver Magazine has good reason to be pro-auto, but his data seems to really have it in for light rail. Cute little chart here about fatalities with various vehicle modes, but compared to 1.1 fatalities per 100 million passenger miles for Passenger Cars, Sabatini gets these numbers for the following modes: Motorcycles (31.5) Light Rail Transit (22.6) Commuter Rail (10.8) Transit Bus (3.7) Heavy Rail Transit (1.4). Here, light rail is defined as “streetcars, tramways, and trolleys”. Again, if there’s data to the contrary, I’d enjoy seeing it. But even if light rail, on average, in the United States is about as safe as automobiles, that’s only half the story because there are extremely different fatality records among urban rail systems— and the distinction appears to be less between light and heavy rail, but rather in whether trans are segregated from drivers, pedestrians, and cyclists. Dug Begely, writing for the Houston Chronicle, made this chart to compare how well Houston Metro was doing on rail safely when compared to other cities. 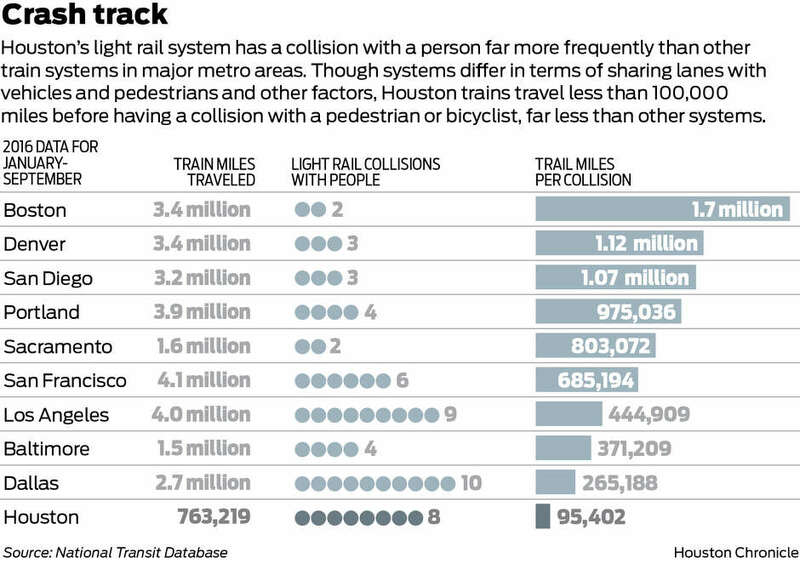 Houston’s street-running rail is simply inherently unsafe. But you don’t have to take my word for it. “Each community and each system is different, and there are probably different factors,” said Metro CEO Tom Lambert… He noted Houston’s system, unlike some others, has more at-grade street crossings and doesn’t have the level of restrictions other systems have to keep trespassers off the tracks. That makes safety a larger part of Metro’s day-to-day challenges, he said. I couldn’t find a well-researched journal article that was newer & more on-topic than this 2001 document by the Federal Transit Administration’s Transportation Research Board. Korve, et al., go into the weeds on fatalities and accidents, comparing 11 light rail systems in the US and Canada. It’s terrific if you want to think deeply about the design of light rail alignments, but there’s not a handy quote to pull out for this article. Clearly, though, Metrolink in St. Louis, with its Exclusive and Semi-Exclusive design did well in its first two years and apparently continues to be largely fatality-free. Ditto Edmonton. But even at the time, Los Angeles’s Blue Line was notable for an unacceptable number of fatalities on surface LRT. And it’s not the transit agency’s management that seems to matter so much. LA’s Green Line is about the same length as the Blue Line, with 14 stations compared to the Blue LIne’s 22, carries almost half the ridership, and opened in 1995, five years after the Blue Line. The Wikipedia article on the Green Line claims that it’s had only one fatality. I think it’s more like a half-dozen. But that’s a small fraction of the 120+ Blue Line fatalities. The Green Line is entirely above grade, running mostly in the median of Interstate 105. The Blue Line has some underground and elevated sections, but its street-running segments have been deadly. The most thoughtful comparison of at-grade LRT with non-grade options might be this blog article from “Voony” in Vancouver. Drawing mostly from French data comparing tramways with subway, he concluded that subways are an order of magnitude safer than LRTs. US data seems to be pretty similar. Non-grade catenary light rail is apparently safer than third rail-powered heavy rail. Accidental deaths on Chicago Transit Authority elevated lines sometimes were the result of a passenger or employee slipping down onto the rails or even crossing the rails. They weren’t hit by trains, but instead came in contact with the third rail and were electrocuted. Platform screens reduce suicides and such accidents to nearly zero. Tokyo plans to gradually install platform screens, but is also trying blue lighting on platforms to reduce suicides. All in all, at this point, I agree with “Voony” that surface LRT has about ten times the number of accidents as non-grade rail— and about three times the number of fatalities. Anyone advocating replacing buses with street-running LRT should be called upon to defend a mode that’s about twice as dangerous. While trains can sometimes be acceptably segregated at grade, Vision Zero for rail is grade separation with platform screens. This study will entail a two-tiered analysis. The first analysis will entail a systematic examination of national trends in light rail safety performance. The second tier will investigate the design-level factors that may be responsible to the crash risk associated with light rail transit. This study will provide a detailed analysis of the safety impacts of two recently-developed light rail systems in the U.S.: Orlando SunRail and Charlotte Lynx. Fourplex Lottery works like this: every ten years, the City would put ten balls numbered 0 through 9 into a lottery machine. One ball is chosen. If the last number in your address matches that ball, your property is automatically re-zoned so that you can build a fourplex. Justification: every neighborhood needs to help with the “burden” of increasing density to fight additional sprawl. This is a “shared sacrifice” that’s fair to every block. These new fourplexes will tend to be more affordable than other residences in the area. In many cases, they will provide an option for empty nest neighbors who want to reduce hassle, upkeep and carbon footprint— but want to stay in the neighborhood. In 1994, Seattle passed a comprehensive growth plan centered around “Urban Villages”. Since 2016, Seattle has been the “crane capital of America,” with strong post-recession growth in residential tower construction. In 2017-18, urbanists in Seattle have pushed proposals for expanding urban villages, permitting more Accessible Dwelling Units (granny flats), allowing smaller residential lots, and adding taller & denser apartments to affordable housing plans. Those proposals are connected to Seattle’s densification, but the timeline runs in the direction above: the 1994 Urban Villages plan preceded a 2010s boom in high rise residential construction and that densification was followed by these new proposals. The new proposals are prospective and have little to do with Seattle’s recent or current construction boom. Bounded on all sides by water and suburbs, the City of Seattle held lengthy community-input sessions to design a new comprehensive plan to manage growth. The result was the 1994 Urban Villages strategy. This 2002 academic study by Daria McDonald and Sasha Tsenkova provides a pre-boom, Canadian view of the strategy. They concluded that it was a “good attempt.. still in its early stages… (that) can already be deemed to be a success.” (p.23) From 1994-2000, “approximately 70% of the city’s new housing units have been constructed in urban centers and urban villages.” (p.21) But the authors were concerned that while new housing had kept up with the plan’s projections, “many more jobs were created than predicted.” (p.19-20) McDonald and Tsenkova focus on the process that created the plan. For details on the urban village concept as applied to Seattle’s neighborhoods, this 2005 City of Seattle document is worth a look. Six Urban Centers were slated for substantial densification— Downtown, three neighborhoods adjacent to downtown (Uptown, South Lake Union and First Hill/Capitol Hill), the University Community (around the University of Washington), and Northgate. See map at 1.8, and note that Seattle excluded its extensive Manufacturing/Industrial Centers. And here’s a helpful Seattle Met article on 25 neighborhoods in the city if you want more context. Since 2010, developers have opened 21,707 new apartments in Seattle’s three urban core markets: Downtown, South Lake Union/Queen Anne and Capitol Hill. That’s a third (33 percent) of the new apartments that opened in the metro area overall. Another 9,378 new apartments are under construction. “That’s 46 percent of everything under construction across the metro,” says Willett. New apartment construction in Seattle has been focused in Downtown and two adjacent urban villages. Commercial areas have been converted to mixed use and residential. Small apartment complexes have been replaced by towers. Very few single family homes were demolished in the process. More than half of Seattle land is still zoned as single family residential. Concentrating new residential housing in these three desirable urban centers has led to the perception that the city’s new apartments are “unaffordable”. Obviously, some people can afford them and their construction has contributed to a stabilization of rental prices in the city. Granny flats have not yet significantly contributed to new residential construction. In 2015, Seattle issued 116 ADU permits; in 2016, 156. That’s about 3% of new apartments. Despite media attention painting Seattle as granny flats-friendly, the rules are still considered a burden. The urban villages strategy has not caught fire in American urbanist thought. Is that because it’s seen as unsuccessful? I dunno. Urbanist proposals in Seattle call for expanding the boundaries of urban villages & urban centers, but allowing more granny flats and eliminating single family zoning city-wide are outside the urban village strategy. Urbanists seem dissatisfied even though the strategy and market conditions will lead to more apartments built during the 2010s than in the previous 50 years combined. Putting aside the question of whether the Seattle urban village strategy should be replicated in other cities— can it be replicated? Sure. I think most cities could pick out a few neighborhoods that are currently zoned commercial or multi-family residential and anoint them as densification zones. And it’s worth noting that Seattle imported the strategy from Britain, replicating processes there. In any case, the conversion of London’s Docklands from abandoned wharves to residential & commercial high rises is sort of an urban village strategy and probably has more to teach us. Did the urban village strategy matter? I’m not sure municipal policy mattered that much, frankly. The two neighborhoods detached from Downtown Seattle that were designated urban centers (Northgate and the University Community) have increased density but not like South Lake Union and Capitol Hill. The designation wasn’t as important as market forces. And it’s a similar story in the #2 city for cranes in America— Chicago. The city at the heart of this population-stagnant metropolitan area is building a few skyscrapers elsewhere, but the adjacent-to-downtown neighborhoods of Streeterville and the West Loop are seeing the bulk of the activity. The similarities to South Union Lake and Capitol Hill abound. Small apartment buildings, warehouses, and commercial buildings are being replaced by mixed use towers. Yet, Chicago has no urban village strategy. And just like Seattle, many White single-family neighborhoods are losing population, sometimes via downzoning. The biggest contribution toward density of Seattle’s urban villages plan may have been giving municipal planners a good excuse to stay out of the way of new construction. Chicago uses carrots. The city’s aldermen enjoy wide latitude to nix projects, but property taxes from new construction tends to find its way into TIF (Tax Increment Financing) kitties, which aldermen can use to improve their districts. Limits on the ability to say no— or incentives to say yes— still have to be combined with market forces to yield denser neighborhoods. Municipal policies may not matter as much as we think. If you have a direct, one-seat transit connection from home to work— if you don’t have to change buses or transfer from bus to rail— congratulations! You’ve managed to order your life sensibly. Many of us have been less wise (or lucky). With that in mind, I write today about transit centers, in defense of their importance if not their typical design or aesthetics. And I’ll be using a broad definition of “transit center”. If you prefer “transit hub,” I won’t argue, but I mean any bus stop where a majority of passengers are transferring to another bus or train rather than walking to their destinations. In Austin, the North Lamar Transit Center calls itself a transit center. In Chicago, the 95th Street Red Line Station is usually called a rail station, but probably 95% of those using the station are transferring from bus to bus or bus to train. In some cases it’s not clear to me whether a majority of people are disembarking to transfer or to walk to a destination. Austin’s Republic Square bus stops downtown and Chicago’s Orange Line Station at Midway Airport fall into that category. Those who enjoy well-ordered lives often envision rail or express bus ridership as people who walk to their stop from home AND work, but it’s clear that large numbers have to transfer. The 95th Street Red Line Station is clear on this. Like almost all of the Chicago rail stations opened between World War II and 2000, 95th was designed as a transfer point. You can tell from this architects’ photo that it wasn’t designed with pedestrians in mind; there’s practically nothing to walk to. Yet, not counting bus to bus transfers, 95th serves around 10,000 passengers a day, about the same as the O’Hare Blue Line Stop. And while Chicago should be commended for re-vamping the station in 2018, soooooooo much more effort has gone into trying to improve life for those O’Hare passengers. How strong are 95th Street’s rail ridership numbers? 10K per weekday is more than any station on the Orange Line, including Midway Airport. It’s half the total for the entire Pink Line and about the same as the entire Green Line south of the Loop. It’s more than any Blue Line station outside the Loop and more than any Red Line or Brown Line station north of Belmont. A monumentally successful rail station doesn’t have to have anything within walking distance. But it’s not just rail in Chicago. Austin’s better-used MetroRapid bus (801) gets a lot of walk-up boardings from its UT and Downtown Stations. (See page 87 at this link for April 2016 numbers.) But outside that Central area and the successful Triangle 801 stop, bus to bus transfers dominate walk-ups. Tech Ridge, the North Lamar Transit Center and Southpark Meadows get higher boardings than any of the other stations. Oltorf and Rundberg edge out the South Congress Transit Center, but those enjoy high ridership crosstown bus connections. The Triangle stop on the 801 proves you can have a successful station without an important bus connection. But North Lamar Transit Center and the CTA’s 95th Street prove that not every station needs pedestrian traffic. Sure, the platonic ideal of a station would include intensity (nearby residential density plus employment) and bus connections. But not every station needs to be the platonic ideal. I have no idea why transit centers have to be so ugly. Well, that’s not true. I do have a suspicion. They’re usually designed for buses rather than bus riders. And the bus riders they serve aren’t people who have the wherewithal to order their lives around one-seat transit trips. Transit center riders don’t expect much from government, so that’s what they get. The people who forget about them don’t intend to neglect those of lesser means, but the effect is the same. If you envision light rail as serving environmentally-conscious burghers who walk from home to their rail stop and then disembark within walking distance from work— well, your vision is excluding a lot of people, maybe even a majority of those who need to be served by rail. A look at Travis County precinct results in the 2000 (.pdf) 2004 (.pdf) and 2014 rail referendums strongly indicates that the geography of the proposal had little to do with the geography of support. Precincts moved as one large herd. Greater Austin’s voters seem to back or oppose rail based on something other than transactional geographic considerations. My guess is that the key issue for most voters is whether the rail proposal reflects their vision of Austin rather than how it affects their neighborhood. It’s likely that a majority of voters either back all referendums or oppose all referendums, while swing voters respond based on the inclinations of leaders they trust or their personal evaluations of the proposal. But precinct outcomes don’t indicate transactional voting— backing proposals that bring railroad to their neighborhood while opposing proposals concerning other neighborhoods. When Austin’s Capital Metro transit authority held rail referendums in 2000, 2004 and 2014, only two areas would have gained rail stations from all three efforts— Downtown and Highland. The proposals’ geographical differences give us a chance to evaluate whether voters are more likely to endorse measures that benefit their neighborhoods directly. The 2000 proposal was the most ambitious, with an initial light rail line running from Downtown up Guadalupe and Lamar to Crestview and then northwest on the route of today’s Red Line up to Howard Station. A couple years later, light rail from Downtown to Ben White along Congress and a spur (along the Red Line tracks) from downtown to MLK Station. By 2025, rail would be extended to the airport via Riverside, down Congress to Slaughter, and all the way to Leander. The 2004 proposal brought into existence the current Red Line, which stretches from Downtown through East Austin and then northwest about 25 miles to the suburb of Leander. 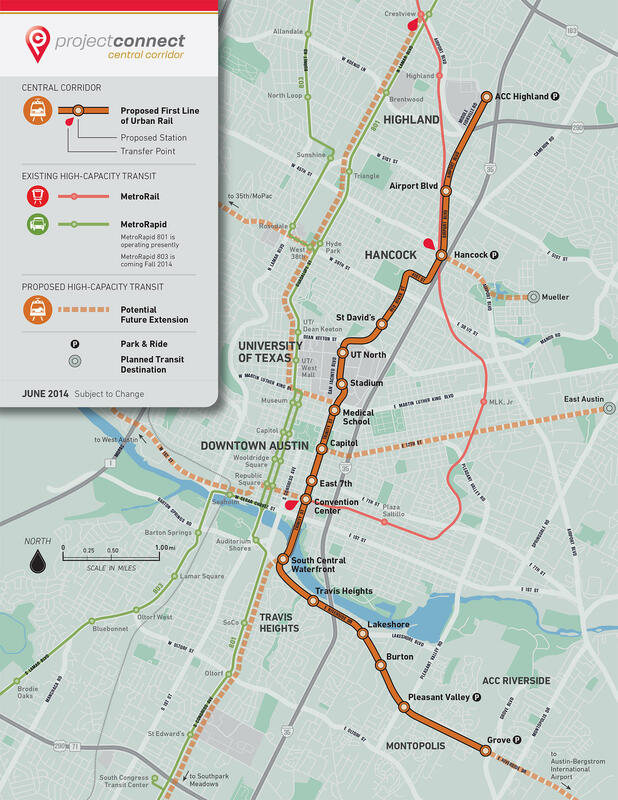 The 2014 proposal would have established light rail from the Airport in southeast Austin to downtown and then north through the UT-Austin campus along San Jacinto and Red River, terminating near the Austin Community College campus in the Highland neighborhood (2014 map). The 200 proposal lost by about 1%; 2004 referendum easily passed 62-38%; while the 2014 proposal failed 43-57%. The 2000 and 2004 referendums were held in November in conjunction with presidential elections. 2014’s was also in November, during the mid-terms, when Texas was electing a new governor. These were the highest turnout dates in their respective cycles. There’s an argument to be made that Republicans were motivated to vote in 2014 in opposition to President Barack Obama, maybe by around 6% nationally, but won’t speculate here how this might have affected a rail referendum in Austin. The composition of the electorate was somewhat different. Austin is a fast-growing metropolitan area and many neighborhoods saw substantial turnover in residents between 2000 and 2014. The 2000 referendum was held in areas conforming to CapMetro’s taxing district, the 2004 election was a Travis County Bond proposal, while 2014’s was City of Austin. Somewhat different configurations of precincts were involved in each of the three referendums, but I don’t yet know of a good explainer for that. I don’t believe the different configurations made a substantial difference, but I’m open to new information. About a third of the 2014 electorate was composed of precincts within what might be considered greater Central Austin, a region bounded by three highways— MoPac to the west, 183 (Research/Ed Bluestein) to the north and east, and Ben White to the south. I would guess that more than half the voters in Austin have never seen a proposal that would bring a rail line within a mile of their precinct. Methods. Some precincts changed designations and/or boundaries in in 2001 and 2011. Working from a map (.pdf) at the time of the 2011 redistricting, I identified about a hundred precincts that kept the same number and substantially the same boundaries by eyeballing said map. That’s not the complete set of unchanged precincts and I may have made some mistakes, but I didn’t cherrypick the hundred. From that hundred, I chose a geographically diverse set to look at with kind of a case study approach. I don’t have the chops to do a thorough statistical analyzation and, even if I did, precinct changes are difficult to deal with. The following study was time-consuming enough as it was. I’m also only dealing with precincts where more than 100 votes were cast. Via Mike Dahmus and this blog article, I then used a 2000 precinct map (.pdf) to add those CTEs. CTE=compared to electorate. I’ll be comparing how a precinct voted compared to the entire electorate for that specific referendum. In other words, the numbers cited as CTE will be that precinct’s percentage support for that rail referendum minus the entire electorate’s percentage support. More than 90% of the precincts in my hundred were within 10% of having the same percent CTE support in 2004 as in 2014. About half were within 5%. This is despite substantial turnover in many neighborhoods and vastly different rail proposals. And while some precincts were quite a bit more supportive or more opposed to rail, the majority of precincts voted within 10% of CTE in one direction or the other. There weren’t humongous differences between neighborhoods. Maybe two-thirds of the precincts had support percentages between 30% and 55% in 2014 when rail got 42% district-wide. A similar proportion were between 50% and 75% supportive in 2004 when rail got 62%. Over 90% of the precincts backed rail in 2004. So, let’s start with nine precincts far from any of the rail referendums’ proposed lines (including the 2000 referendum’s extensive rail network– explained here). These precincts’ behavior suggests that support percentages mostly move with the herd, that support for rail tends to remain consistent despite the specifics of the proposal. Precinct 129, where I spend a lot of time, stretches southeast from the intersection of MLK at Springdale to east of 183 (Ed Bluestein here) all the way to Driveway Austin Motorsports at the Colorado River. CTEs were 6.4% below the electorate (-6.4) in 2000, +1.6 above the electorate in 2004, and +5.1% above in 2014. More African-American than most of Travis County, 129 has been gentrifying along Springdale. The denser neighborhoods near Springdale enjoy very good bus service and the eastern half includes the proposed Green Line rail line. The 11.5% CTE difference between 2000 and 2014 is rather high for these precincts. Precinct 154 is west of where Highway 290 meets Parmer in the northeast, near the city of Manor. 2000 CTE was -5.5%, 2004 CTE was -5.2%, with -5.5% CTE in 2014. None of the rail proposals came anywhere close to 154, although it’s near the current Green Line plan for commuter rail to Manor and Elgin. That’s a ridiculously consistent level of opposition to and support for rail, but is a more typical story than 129. Precinct 210 voters are in near west Austin, mostly north of Muni Golf Course, south of Windsor, west of Exposition and east of the Colorado River. The #18 bus serves the area. CTEs were -1.8% in 2000 (then numbered Precinct 371), +6.3% in 2004 and -3% in 2014. None of the propositions would have put rail anywhere near this old Austin neighborhood. Precinct 211 is mostly east of Lamar between Parmer and Braker. The Red Line runs quite a bit west, but the #1 and #392 buses run along its edges. The MetroRapid 801 passes through this precinct but has only recently gained an 801 stop. The major transit center of Tech Ridge is a couple miles northeast. Tech Ridge might be the northern terminus of a future Guadalupe/North Lamar light rail line. 211’s CTE’s were -9.3% in 2000, -7% in 2004 and -3.8% in 2014. Precinct 220 is between Mt Bonnell and where the Capitol of Texas Highway meets the Colorado River. Like 262, it’s within the city limits but far from any rail proposals and no bus routes go near it. CTEs were -4.4% in 2000, -5.4% in 2004 and -7.5% in 2014. Precinct 262 is west of MoPac between Steck and Far West. It’s served by the #19 Bull Creek bus route and a UT-Austin shuttle route. In 2004, 62.6% of 262’s voters favored the Red Line, for a CTE of about +.7%. In 2014, the proposal got 42.8% district-wide and 41.5% in Precinct 262. CTE rounds down to -1.2%. In 2000, this precinct was somewhat smaller and that incarnation had a CTE of -1.2%, also. None of the proposals promised rail lines anywhere near this neighborhood, yet it was something of a bellwether. Precinct 362 is in southwest Austin, west of MoPac and south of Convict Hill Road, where a bus runs. CTEs were -6.5% in 2000, -10.7% in 2004 and -12.2% in 2014. Precinct 450, bounded mostly by Nichols Crossing, Burleson, and McKinney Falls Parkway, was -9.5% in 2000, -6.5% in 2004, and -9.6% in 2014. 450 is southwest of the airport and would have been a couple miles from any proposed 2000 or 2014 rail stops. Since those nine precincts generally opposed rail referendums, we could argue that that their opposition is grounded in a transactional approach— that since rail will never come near their residences, they’ll oppose all rail. But it would be hard to separate that decision-making from a vision-based approach. They may choose their neighborhood because they have no interest in transit. In any case, there’s very little in the Project Connect discussions that would put better transit within walking distance of most of these voters, anyway. It’s unreasonable to devise even a far-flung rail proposal that would put rail stations within walking distance of a majority of rail referendum voters. But maybe the voting data for precincts within walking distance of rail stations in the 2004 or 2014 proposals— but not both— would show a transactional approach. Precinct 421 is in Travis Heights and would have gained a light rail stop along Riverside Drive had the 2014 referendum passed and one or more stations along South Congress had 2000 passed. The 2004 referendum stations were across the river. CTEs were 14.8% in 2000, +15.5% in 2004 and +15.7 in 2014. Travis Heights has been supportive of rail whether or not the plan included the neighborhood. Precinct 260 is east of MoPac, from Braker to Research. It includes UT-Austin’s Pickle Research Center and lies just south of the Red Line’s Kramer Station. A stop at Braker Lane was anticipated with both the 2000 and 2004 rail proposals, but not in 2014. CTEs were +1.1 in 2000, +3.2% in 2004 and -2.1% in 2014. Or consider Precinct 207, west of MoPac between Parmer and the Williamson County line. It includes Howard Station on the Red Line, which was also seen as a permanent stop on the 2000 light rail proposal. CTEs were -2.6% in 2004 and -6.4% in 2014. Frankly, I’m still unclear as to what precinct this neighborhood belonged to in 2000, but the probables (Precinct 204 or Precinct 207) both had CTEs of -2.0%. Precinct 423, which includes Montopolis (Grove, Riverside, Ben White, Bastrop Highway), shows a possible transactional effect. The 2004 proposal had nothing for the neighborhood and its CTE was -6.2%. Different story in 2014, though, when a proposal that would bring a rail stop to Grove at Riverside had a CTE of +4.5%. The 2000 proposal would have brought light rail to Riverside eventually and the CTE was -12.1%, so it’s more likely that this significant 16.6% CTE movement has more to do with new residents. Using only precincts that were unchanged during the 2011 redistricting left me without a Red River Street example, but it looks like Precinct 206 used to be numbered 146. 206 includes the half of the main UT campus east of San Jacinto and then neighborhoods north to 38th St. 2004’s proposal had nothing for then-146 and its CTE was 15.4%. The promise of light rail up San Jacinto and Red River increased its CTE all the way to 15.5%. And then what to make 2000, when the nearest station would have been a couple miles away and Box 146 had a CTE of +19.8%. Such small changes in rail support may result from a number of things— residential turnover, turnout in a presidential election vs. a GOP-friendly mid-term, or maybe just a localized different attitude toward CapMetro. But even if these differences were entirely transactional, they represent a tiny inducement for adding a station or route to a proposal in order to pass it. Each of these precincts cast less than 1% of the total votes. Moving, at most, 10% of that 1% just isn’t worth diminishing the overall effectiveness of a transit proposal. And there are examples that suggest a rail station might harm support in a precinct. Precinct 439is just east of the Plaza Saltillo Red Line Station, including territory from Comal to Pedernales and East 7th to the river. 2004 CTE was -.8%, but +13.9% in 2014. CTE in 2000 was -4.6%. This precinct has undergone a significant change in density and that probably explains the vote changes better than anything. Maybe rail increases gentrification, but there’s more evidence for gentrification increasing support for rail. The total votes cast in the three referendums were 746 in 2000, 887 in 2004, and 944 in 2014. Note that the first two elections had presidents on the ballot while the third was a mid-term. The number of ballots cast concerning a City of Austin proposition in 439 in the presidential election of 2016 was 1626. We could also compare precincts that are near each other, one with rail in both proposals and one without. Precinct 149 goes from Airport Blvd at Lamar south and east to Duval at 53rd. CTEs were +8.1% in 2000, + 7% and +15.5%. The 2000 proposal would have seen a light rail stop near Airport and Lamar, the 2004 referendum delivered Highland Station and 2014 would have brought a separate light rail line up Airport Blvd. Did proximation to these amenities improve rail’s numbers? I doubt it. Those numbers are less pro-rail than we find in Precinct 135— Windsor Park and Mueller— which is a couple miles from both the MLK Red Line Station and the other two referendums’ proposed light rail lines. 135’s CTE’s were +7.4%, +10.8% and +21.2%. The development of the former Mueller Airport has significantly changed the relative sizes of these boxes. 149 cast 905 votes in 2000, 864 in 2004, and 737 in 2014. 135 hasn’t changed its boundaries, but the totals are, respectively, 1461, 1365, and 2475. The total ballots cast concerning a November 2016 proposition were 1181 in Precinct 149 and 4259 in Precinct 135. Questions for future study. A precinct map for 2000 would help me include that election. There’s a collection of precincts currently numbered 333-336 that either did change its rail support or were renumbered in 2001. Otherwise, the above 2004/2014 examples look similar to 2000 precinct results. There are better mathematical approaches than what I’ve laid out here. Someone with those skills and the ability to connect old and new precinct numbers could perform a better study. Studies of other cities’ rail referendums would be interesting. It could be that Austin’s voters are unusually non-transactional. What does this mean for drawing up a 2020 rail referendum proposal in Austin? The obvious takeaway is that Austin voters aren’t transactional. That is, there’s no need to promise rail to wide swathes of the city. It may well be that, on the whole, a rail station is viewed as being just as much a threat to a neighborhood as a benefit. On the other hand, a narrative that certain areas are always ignored could be harmful. My specific advice for 2020 is to concentrate on the best corridor for rail— Guadalupe/Lamar from Republic Square to the North Lamar Transit Center— and give CapMetro the authority and money to purchase land for future rail investments in other neighborhoods open to rail. The land could be used for supporting rail directly or just to capture increased land value in an effort to defray expenses. Compared to the 2000 and 2014 referendums, 2004’s had more support from Republican leaders, including Round Rock state Rep. Mike Krusee, and muted opposition from long-time rail foe Gerald Daugherty. (Austin Chronicle Nov 5, 2004 recap here.) There’s a balancing act that CapMetro has to perform here. The agency wants broad support, but compromise too much and it’ll be stuck with a proposal that’s bad transit policy, which 2004 arguably was. Since Travis County precincts tended to move as a herd from 2004 to 2014, regardless of how Republican the precinct was, it’s an open question whether mollifying GOP leaders was all that valuable. It could be that there were larger forces at work here. The ambitious 2000 rail proposal lost by only 1%; it could be that the 2000 proposal would have passed in 2004, but not 2014, but yes again in 2000. We don’t know. Anyone who votes for (against) rail because it can (can’t) clear today’s traffic jams off I-35 is a sucker. Transportation investments are like fruit trees. You plant them for your grandchildren. Austin is a big city. Big cities have traffic. Deal with it the old-fashioned way. Find alternate routes. Shop elsewhere. Work at home. Move closer to your job. Take charge. Types of transportation in photo: bicycle, private car, bus, electric trolley bus, three-wheeled motorized cart, horse and cart, and what Beijingers call the #11 bus– walking.